Welcome to Razorback Moving & Storage! Welcome to Razorback Moving & Storage! More news coming soon. 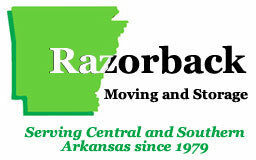 Razorback Moving and Storage is a full service mover, serving Central and Southern Arkansas since 1979. As a family-owned agent for Mayflower Transit, we have the experience, resources and expert staff that enables us to ship anything anywhere. No matter how small or large your move, we provide the expert moving services to take care of it – ensuring your possessions arrive safely and on time. Simply fill out the form to the left or give us a call and we’ll contact you to schedule your free moving quote. See just how affordable professional movers can be! We’re Proud to Be An Agent for Mayflower! Mayflower Transit has been moving families around the country and across towns since 1927 with great care and expertise. More than 40 million Americans will be “packing it up and taking it on the road” as they move to new homes this year. With Mayflower Movers and Razorback Moving and Storage, you can depend on quality moving services, unsurpassed in the moving industry. I would recommend Razorback Moving and Storage to ANYONE looking to move.